NEW YORK CITY, November 9, 2017 – GFNY, the Global Marathon Cycling Series, returns to Cozumel, Mexico this Sunday, November 12th. 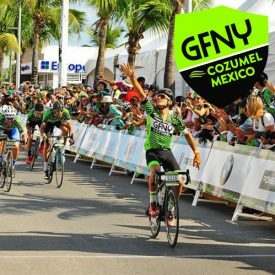 A record 3000 riders from 55 nations will take on the 1- or 2-lap courses circumnavigating the island as they take on the 4th annual GFNY Cozumel. Riders will be treated to spectacular views of the Mayan island paradise. A total 65 km of the route will be along costal roads that run parallel to Cozumel’s pristine turquoise sea waters. GFNY Cozumel’s 160km long route is a qualifier for the racer corral at the 2018 Campagnolo GFNY World Championship in NYC. GFNY debuted in Cozumel in 2014. Four years on, the event has grown from strength to strength complete with live bands, cheering zones and a Mexican fiesta at the Finish Village. Cozumel is known for being flat, the highest natural elevation being 15m above sea level, but it is also known for the notoriously strong trade winds. The winds present riders with a unique challenge, in contrast to the usual ‘King of the Mountain’ (KOM). GFNY Cozumel’s ‘King of the Wind’ challenge begins at 27km on Lap 1 and 110km on lap 2, when the course swings north onto the beachfront road along the windy Eastern shore of Cozumel and riders are greeted with relentless head and side winds. GFNY is the global cycling marathon brand with events held in NYC, Argentina, Bali-Indonesia, Brazil, Chile, Colombia, Costa Rica, Germany, Samosir-Indonesia, Italy, Jerusalem-Israel, Malaysia, Cozumel-Mexico, Monterrey-Mexico and Uruguay.